This river is located in Banister, a little village just outside of Old Harbour. There hasn’t been much rain lately so the river is very low at this time, but look how high it can get. Nonetheless, I walked the river path, which made me feel very eerie; the way the trees towered over me, the loose dirt and stones on the river banks…I felt like a wall of water could come rushing towards me at any minute. Simply put, as much as I wanted the experience, I couldn’t wait to get out of there, lol. 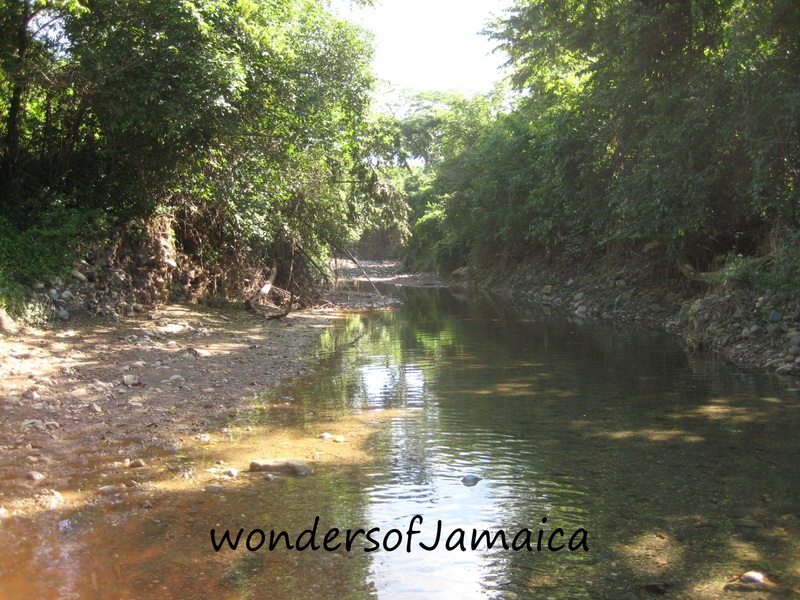 This entry was posted in Culture, Jamaica, Jamaica Vacations, River and tagged Environment, Jamaica, nature, Old Harbour, outdoors, rain, river path, Rivers and Streams, travel, Travel and Tourism, wall of water. Bookmark the permalink. Looks like you could just walk in the water. Thank you for sharing your photos. Thank you for stopping and your comment. Yes I did walked in water just a little bit lol.